Just as farmers and crafters work through the winter months, caring for animals, planning their crops or making new inventory; a farmers’ market manager and board continue to work throughout the year to ensure a successful market season. There is much to be done during these short winter days. This is a great time to evaluate the previous season, communicate with market sponsors and maintain relationships with current vendors and customers. We also take this time to learn about best practices and develop important skills in marketing and management. Soon our advertising budget will be set and outreach will begin for the next market season. 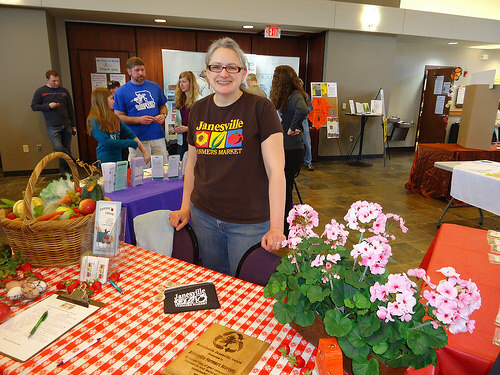 For the Janesville Farmers Market, things are starting to get exciting – in a good way. Although our market will be moving to a new, temporary location for 2015, we have new grant money from the USDA Farmers’ Market Promotion Program Grant (FMPP) that will allow us to build our market and advertise more than ever this year. Thanks to FMPP, there will be fresh, new advertising on local buses and billboards, a JFM brochure, chef demonstrations at the market and an increase in activities for kids and families. 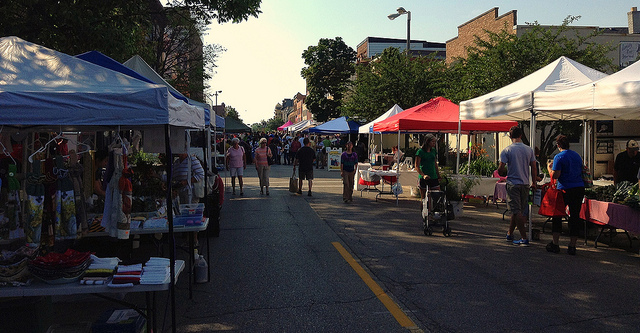 2015 and 2016 will be the years of data collection for the Janesville Farmers Market. With our USDA grant funding, you can expect to see more customer and vendor surveys, dot surveys (multiple choice questions for customers to answer with sticky dots) and customer counts. All data collected will go to help us improve and promote our market. Some data will be used to report on the benefits of the FMPP funding and ultimately to help other farmers’ markets nationwide. We appreciate your help with the data collection, which will be anonymous and will only take a few minutes of your time. Even as early as January, we can begin to sow the seeds for the next market season. During this time, we continue to cultivate community partnerships, working closely with ECHO, Head Start and Rock County Farm to School. Beginning the second Wednesday in January, market manager Stephanie Aegerter is offering a series of monthly “Wellness Wednesday” classes with local food at 6 pm in the Community Room at Basics Cooperative. Toward the end of January, you will find us doing community outreach at the Rock County Head Start 50th Birthday Celebration on January 24th and the Rock County Farm Bureau’s Ag Showcase on January 29th. That same week we will have an opportunity to connect with and learn from other farmers’ markets at the Wisconsin Fresh Fruit and Vegetable Conference and the annual meeting of the Wisconsin Farmers Market Association. February 7th will be our Annual JFM Vendor Meeting at 2:00 pm in the Community Room at Basics Cooperative. Vendors and supporters of the market will come together to vote (and run) for the board of directors. We will also talk about what’s new for the coming season and give vendors an opportunity to register at a discount. Watch for an announcement about our 2015 temporary location in Downtown Janesville. Where will the market go in 2015? Watch for an announcement in February! Wellness Wednesday classes will continue on the second Wednesday of February with a yogurt fermentation workshop. We are looking for additional opportunities to do outreach and education throughout the community during the winter months. Your Market Manager will also begin to purchase kitchen equipment and form relationships with local chefs for cooking demonstrations at the market. If you know any local food chefs who might be interested in offering cooking demonstrations at the market in exchange for promotion opportunities, please encourage them to contact us. We would love to offer more frequent Winter Markets with a goal of eventually having a year round market. The December Holiday Market was in many ways a great success and also a great learning experience. We are considering another indoor winter market at the Senior Center in March or April if there is a date available and several farmers with products to sell. Please sign up below for our email newsletter and be the first to know about upcoming events and winter markets. As you can see, Janesville Farmers Market is already gearing up for a successful 2015 season. Thank you for your commitment to our community market. You make the market great!